Throughout the year, EISA Mozambique provided extensive analysis and advice on electoral matters to EMBs, the donor community and the general public, and was present regularly in the print and broadcast media providing commentary on electoral matters. EISA organised a public presentation and a series of media appearances by Elisabete Azevedo, a Portuguese scholar attached to the University of Cape Town who wrote a working paper of the Mozambican Parliament and the Mozambican Members of Parliment (MPs). This study was the first of its kind in that it contained a profile of the Mozambican MPs based on in-depth interviews with 20% of the Mozambican MPs on the basis of a stratified random sample. The presentation was well-received and well-attended with over 70 participants, including the chairs of five parliamentary committees. Ms. Azevedo was then interviewed by a number of newspapers and radio stations and appeared on two TV shows. Her study has been published as an EISA working paper: The Assembly of the Republic of Mozambique: From enemies to adversaries? [PDF]. The Mozambican office of EISA hosted a presentation by Dr Elisabete Azevedo, followed by public debate, on The Profile of the Mozambican Parliament and the Mozambican MP: From enemies to political adversaries? in Maputo on 26 May 2009. Around 70 people attended the presentation, including ten senior MPs. Two MPs, the rapporteur of the majority Frelimo bench and a former Renamo minority whip, were discussants. The presentation received wide media interest and coverage. She was interviewed by a number of TV channels, radio stations, and print media, as this was one of the first studies of this nature on the Mozambican Parliament. Her study of the Mozambican Parliament began in 2005 as part of her PhD dissertation research and was concluded in 2008. She conducted qualitative interviews with MPs, staff, journalists, academics and civil society representatives, in addition to the review of parliamentary documents and studies, and direct observation of the functioning of the Parliament. She also conducted an in depth quantitative survey of 50 MPs through a random, stratified sample. Elisabete Azevedo, a Portuguese national with considerable Africa experience, has a PhD in Political Science from the University of Cape Town and is a researcher for UCT and the Catholic University of Lisbon. Throughout the year, EISA provided, on a continuous manner, analysis and advice on electoral matters to the EMBs, the donor community and the general public through several media events on TV, radio and the print media. In particular, EISA provided intense analysis on the Zimbabwe electoral process through the Mozambican media and public debates. EISA, in collaboration with the Mozambican Institute for Socio-Economic Studies (IESE) and the Comparative National Elections Project (CNEP), organised a series of three public debates on electoral participation/abstention with a focus on Mozambique. The topics addressed in the debates were: "The Electoral Cartography of Mozambique" by Luís de Brito from IESE, "The determining factors of the vote in Mozambique" by João Pereira from IESE and "Post-election surveys in new democracies" by Pedro Magalhães from the Portuguese Institute of Social Sciences of the University of Lisbon. The debates were well-attended and generated good media coverage. EISA provided continuous analysis and advice on electoral matters to the CNE and the STAE, the donor community and the general public. In this respect, EISA consistently and pro-actively advocated, through the media (such as local TV stations and international media like BBC radio), for a constitutional amendment to allow the postponement of provincial elections, initially scheduled for 16 January 2008, arguing that the time available to prepare for the elections did not allow for a technically efficient process and adequate voter mobilisation. The first real indication of a disastrous process was the fact that after 20 days (out of a total of 60) of voter registration only 5% of the potential electorate had been registered. As a result of public pressure, the ruling party, Frelimo, announced on 17 October 2007 that it would seek a constitutional amendment to postpone the election. The amendment was passed the following month. EISA published a report of the survey on Voting Behaviour in Mozambique for the 2004 General Elections, Formação do voto e comportamento eleitoral dos Moçambicanos em 2004 [PDF], conducted by EISA in partnership with Centre for Population Studies (CEP) from Eduardo Mondlane University in 2005 under the Comparative National Elections Project (CNEP). The study was made possible with the financial support of Austria Cooperation for Development through Austria Institute for Cooperation North-South. The report consists of five sections: After a brief description of the methodology used, the first section presents some findings on the socio-economic perceptions of voters. This is followed by a section on access to information, the role of the media and citizen awareness levels of, and interest in, politics. The third section examines the role played by Mozambican institutions and social networks in forming political opinion among the electorate. The fourth section presents an assessment of the democratic system by the voters and finally, the fifth section analyses voting behaviour and provides an evaluation of the electoral process in Mozambique. EISA Mozambique was also involved with the dissemination of the regional Principles for Election Management, Monitoring and Observation (PEMMO) in Mozambique. EISA organised a national launch of PEMMO in its Portuguese version and distributed it widely to election stakeholders. EISA also trained domestic observers on how to use the PEMMO to assess the election in Mozambique. 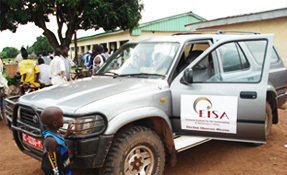 Furthermore EISA distributed the principles to all domestic and international election observers during the 2004. EISA also produced handbooks on electoral legislation, in English and Poruguese and a Guide for the Election Observer for citizen observers.